Hearts are Trumps. 1872. Sir John Everett Millais Bt PRA (1829-96). Oil on canvas. 1657 x 2197. Courtesy of the Tate, NO5770. Released by the gallery on the Creative Commons CC-BY-NC-ND (3.0 Unported) License. Commentary by Jacqueline Banerjee. The gallery label of August 2004 suggests that this painting recalls the works of Sir Joshua Reynolds, expressing "in its flattering depiction of the fashionable sitters, ... a gentle and nostalgic vision of family life." 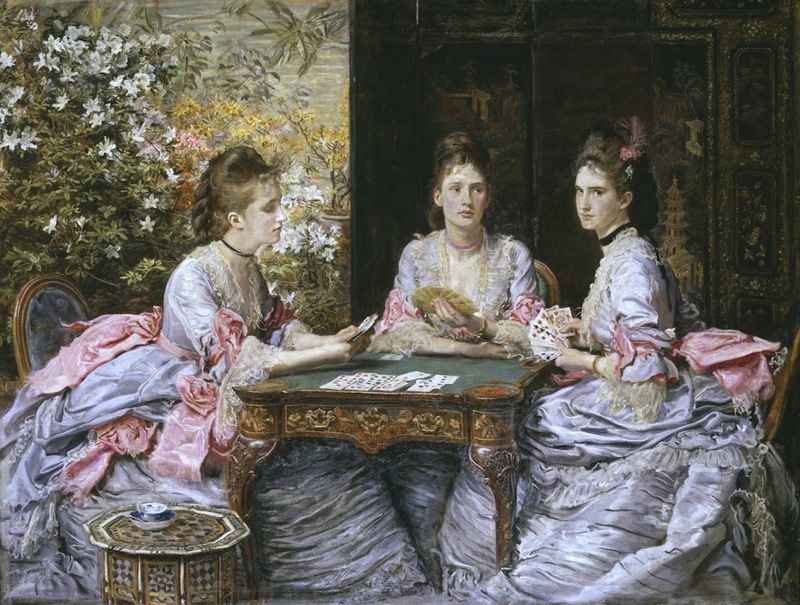 According to Kenneth Garlick, the subjects in their sumptuous dresses are the three sisters, Elizabeth, Diana and Mary, daughters of the well-to-do merchant Walter Armstrong, and sisters of his son, the future Sir Walter Armstrong (1849-1918). The latter was already an art critic and would later become director of the National Gallery of Ireland. The sisters were still in their twenties at the time. The gallery label says that Mary, who is looking directly at us, holds most of the trumps: "Delicately, the card game hints at sisterly competition in husband-finding." The masses of flowers and the great sea of fabric, both rendered in fine detail; the equally detailed and often exotic background; the subtleties of the colour and the meaningful expressions on the young women's faces — which, however, still require interpreting — all make this painting at once dazzling and intriguing. In fact it is only superficially the "gentle and nostalgic vision of family life" of the gallery label's description, just as it only bears a superficial resemblance to the work of the "famous Sir Joshua." Garlick, Kenneth. "Armstrong, Sir Walter (18491918). Oxford Dictionary of National Biography. Online ed. Web. 7 October 2017. "Hearts are Trumps." Display Caption. Tate. Web. 7 October 2017. Millais, John Guille. The Life and Letters of John Everett Millais, President of the Royal Academy. 2 vols. Vol. 2. New York: Frederick A. Stokes, 1899. Internet Archive. Web. 7 October 2017.